The technology principle - Newater Technology, Inc. 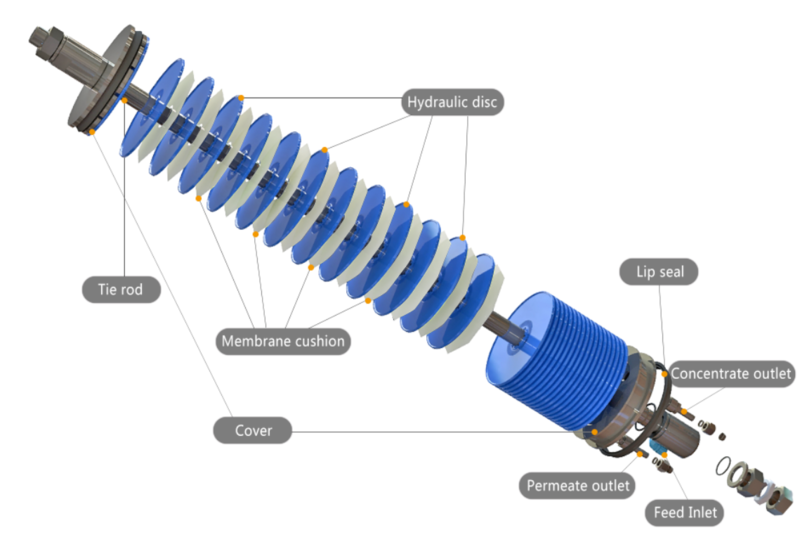 The disk tube (DT) membrane module technology, including disc tube reverse osmosis (DTRO ) and disc tube nanofiltration (DTNF ), is a unique technology for the membrane separation module. The DT membrane module is an open channel. The distance between the adjacent hydraulic discs is 4-6 mm. The convex points are distributed in a certain pattern on the disc surface. 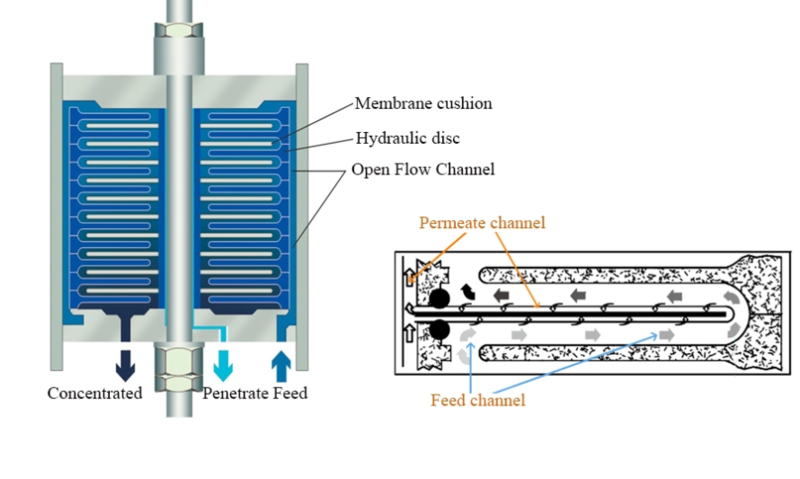 These specially arranged convex points enable the treatment fluid to form the strong turbulences as it flows through the membrane surface, thereby increasing the transmittance and self-cleaning function, and conversely, reducing the membrane plugging and the concentration polarization. It is also easy to wash the fouling off the diaphragm. Thus, the DT membrane module is suitable for treating wastewater with high turbidity and a high sand-bearing coefficient. The DT module is a novel kind of membrane separation module with excellent high-pressure resistance and anti-fouling characteristics, which is mainly used in liquid desalination and purification. The DT module can perform with high economic efficiency even under conditions characterized by high turbidity, high SDI, high salinity, and high COD. It has been proven by real life cases that the life span of Jinzheng environment-friendly, first-stage DT diaphragm (used in the treatment of landfill leachate), could be up to 3 years or even longer. If DT membrane modules were integrated with other pretreatment equipment, such as MBR , the DT membrane module’s life span could be extended to more than 5 years, which is not possible for a spiral wound reverse osmosis membrane module. The DT module is composed of membrane cushion, hydraulic disc, O-rings, tie rod, pressure vessel, etc. The membrane cushion stacks on the hydraulic disc. The O-rings are placed in the groove on both sides of the hydraulic discs. Thecomponents are stacked and tightened with the tie rod, then placed into the pressure vessel. The two ends of the DT membrane modules are sealed with metal covers.